Unlike the last two winters, this year we’ve had a more “normal” year, with a good snow pack fueled by alternating bands of rain/snow and sun. It’s not unusual to have a stormy night, followed by a bluebird morning, and then a gray jay afternoon as the next storm moves onshore. 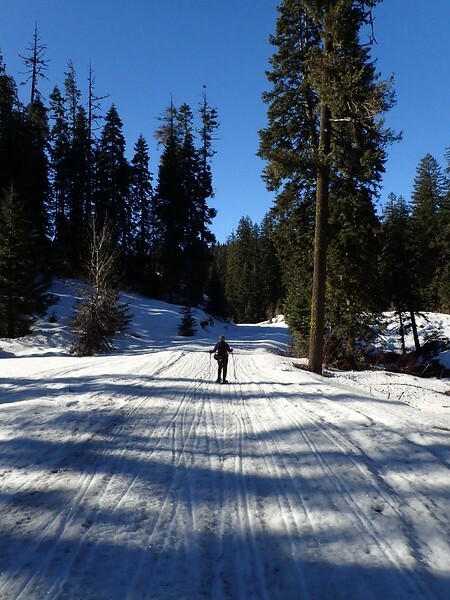 So we’ve become somewhat adept at finding hikes or snowshoes that can fit into the bluebird part of this cycle. 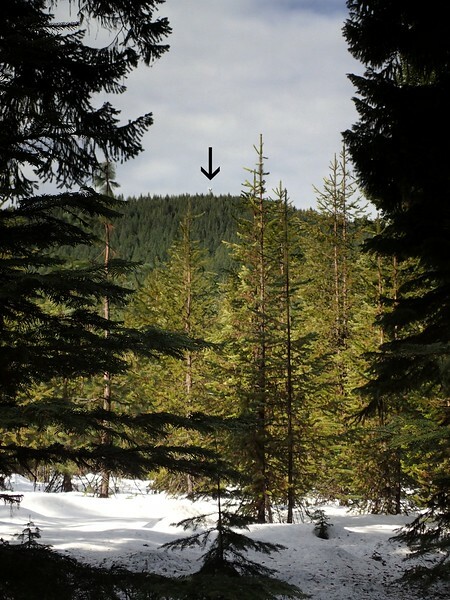 A snowshoe hike to Robinson Butte fit nicely into this limitation. 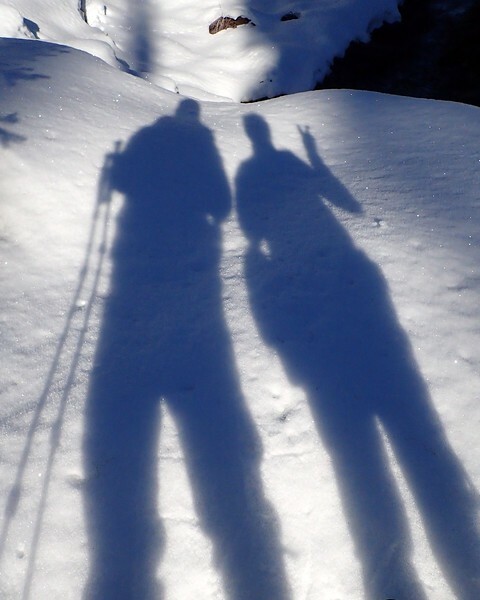 where we indulged in a spectral selfie. 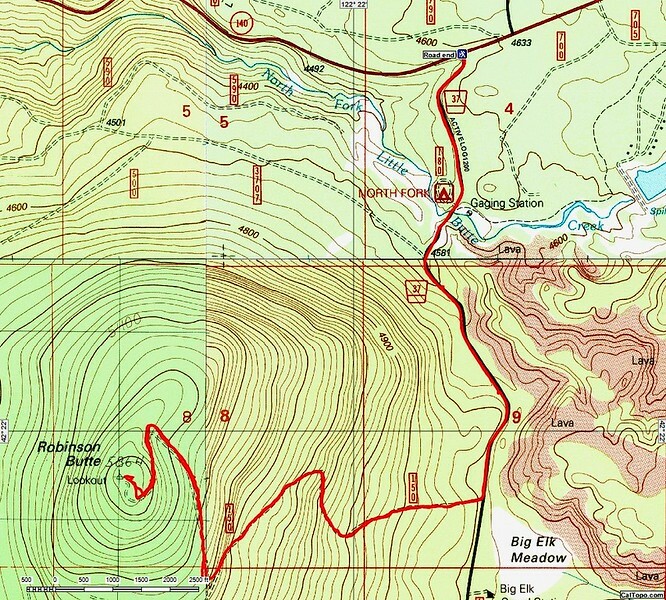 to where we turned right (west), at an unsigned junction, on to FR 37-150, which we followed all the way up to the lookout. You can’t see the lookout from FR 37 but you can see the antennas sticking out of the comm station next to the lookout. 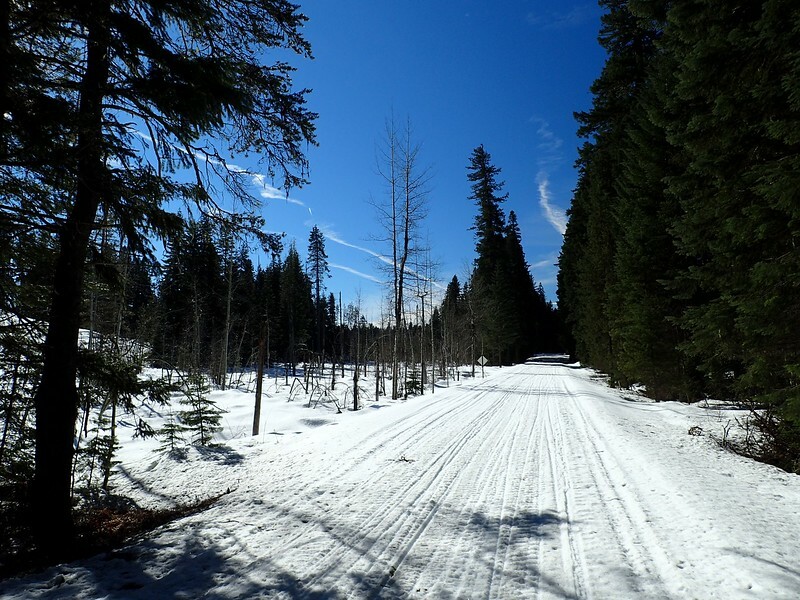 Evidence of snowmobiles diminished rapidly the further we got from FR 37 and we began to have more of a wilderness experience. 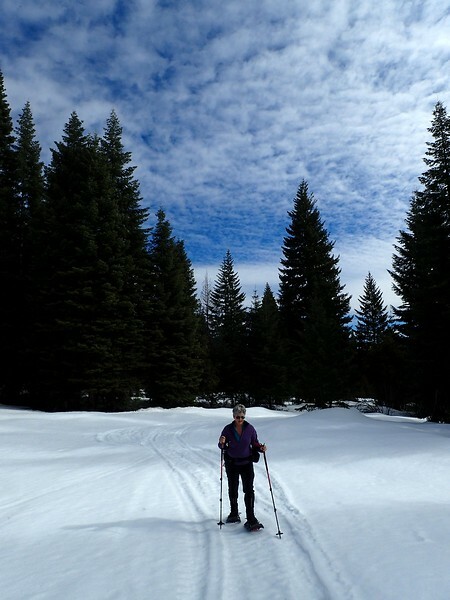 Although we wore our snowshoes almost the whole day, the snow – even absent compaction by snowmobiles – had settled a lot between 4,000 and 6,000 feet and we could easily have done without them. 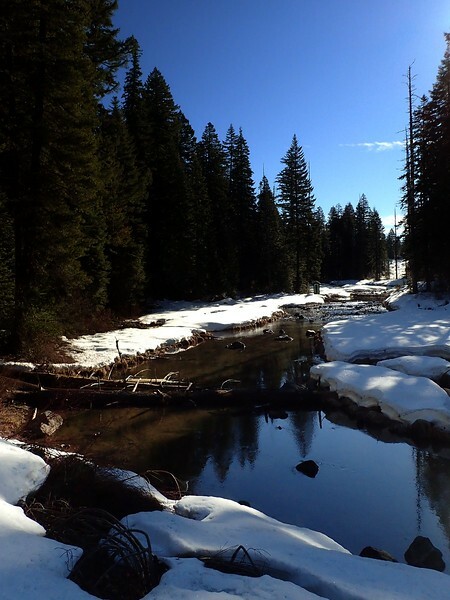 Erosion and compaction of the snowpack is starting to pick up as we continue to get wet – but now warmer – storms. About half way along FR 37-150 to the lookout, we came to the only sign pointing the way. 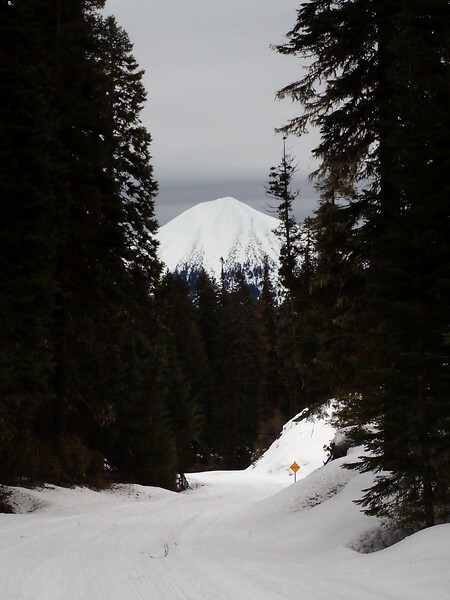 Beyond here, snow cover and blowdown had conspired to block snowmobiles (but it looked like they’d tried real hard to drive up the road), so ours were the first tracks on the snow below the lookout. 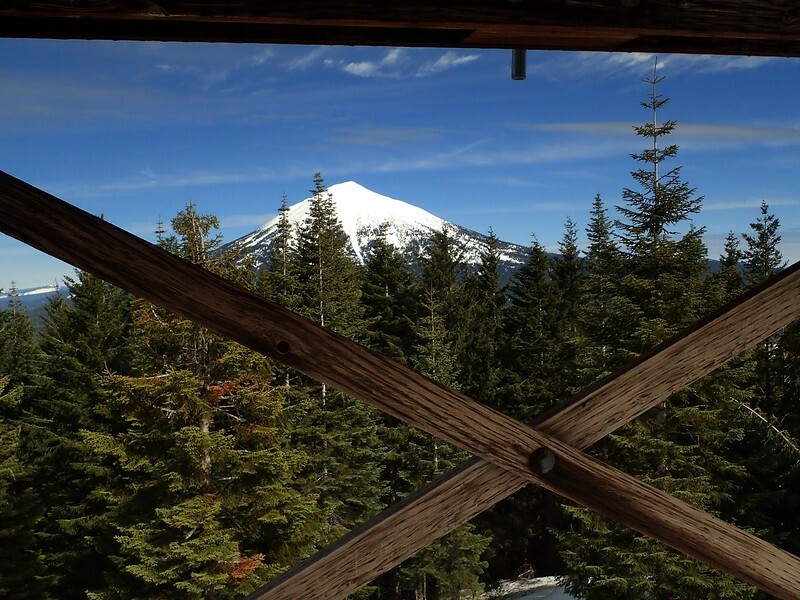 According to the History of the Rogue River National Forest, Robinson Butte was first established as a fire lookout camp in 1913 and the first tower was a 20-footer built in 1933. 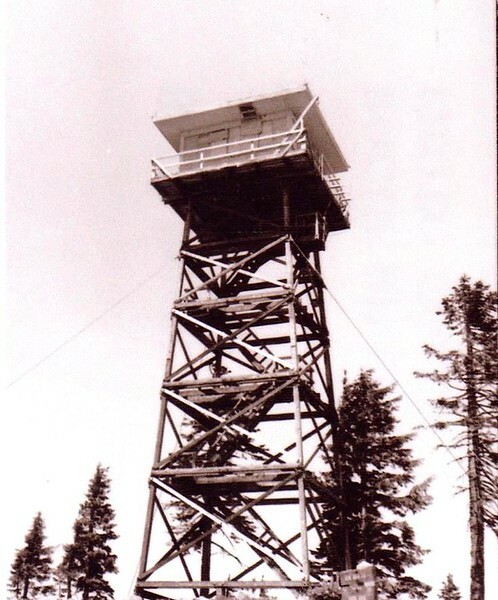 The present 53-foot tower was originally built in 1963 on Blue Rock, overlooking the Sky Lakes Wilderness. 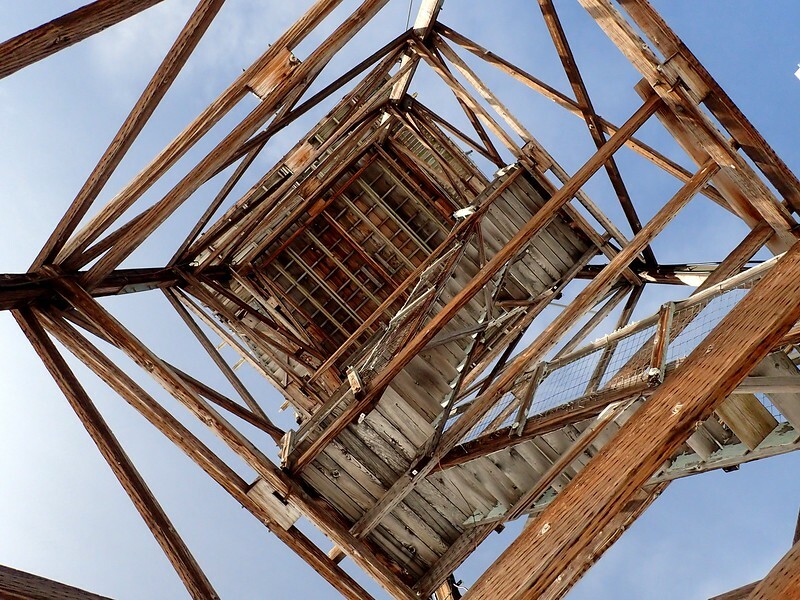 In 1974, the timber tower and R-6 flat roof cab forming the Blue Rock Lookout were trucked to Robinson Butte and erected as a replacement for its old tower. 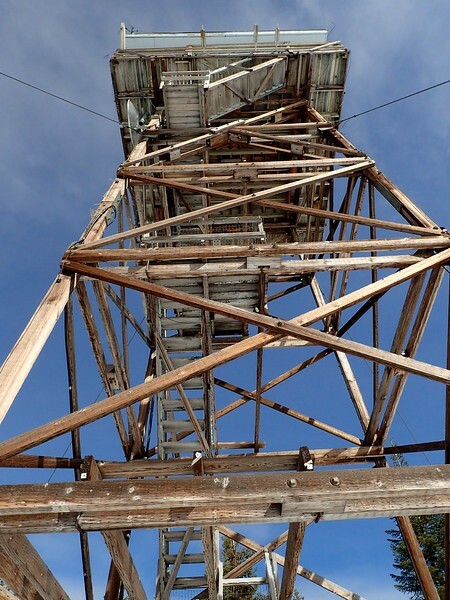 The tower is now on the National Historic Lookout Register. 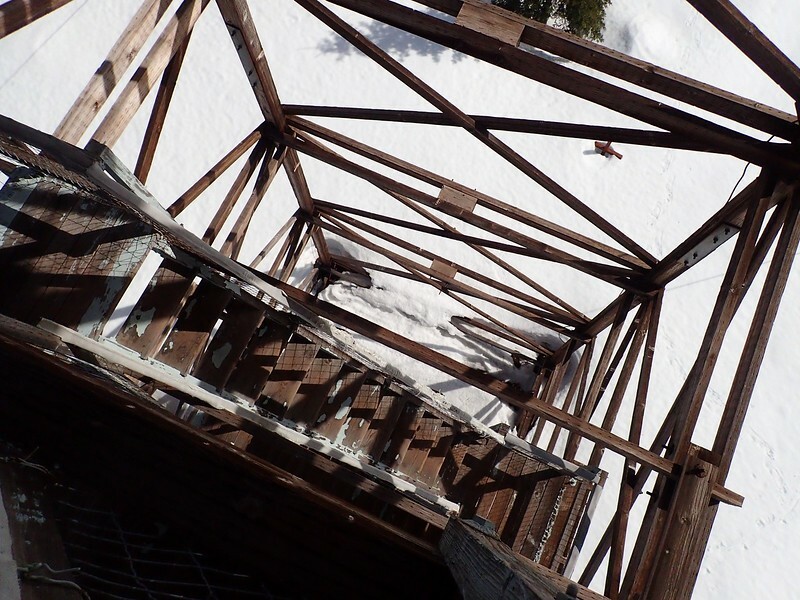 All that remains at Blue Rock are the foundations of its relocated lookout. 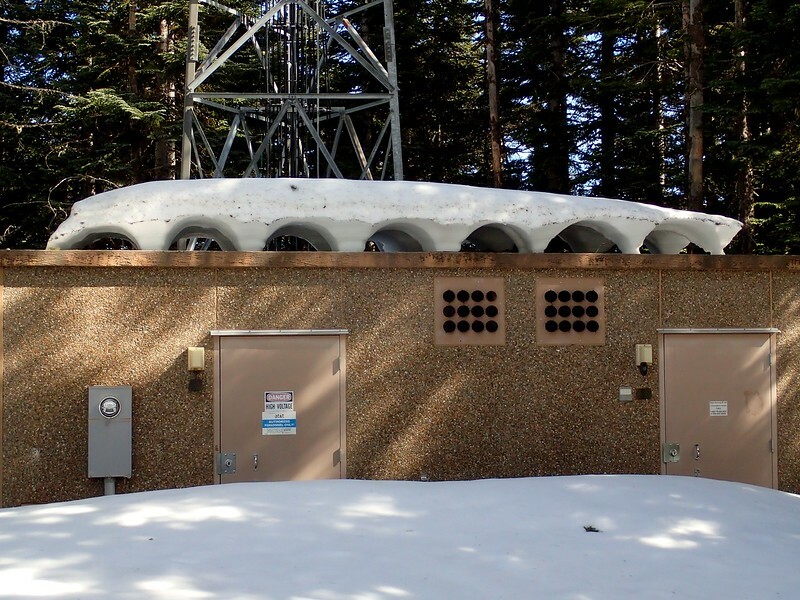 The lookout shares the summit with a comm station, where heat from its power source had melted its snow cover into a semblance of a Roman aqueduct. 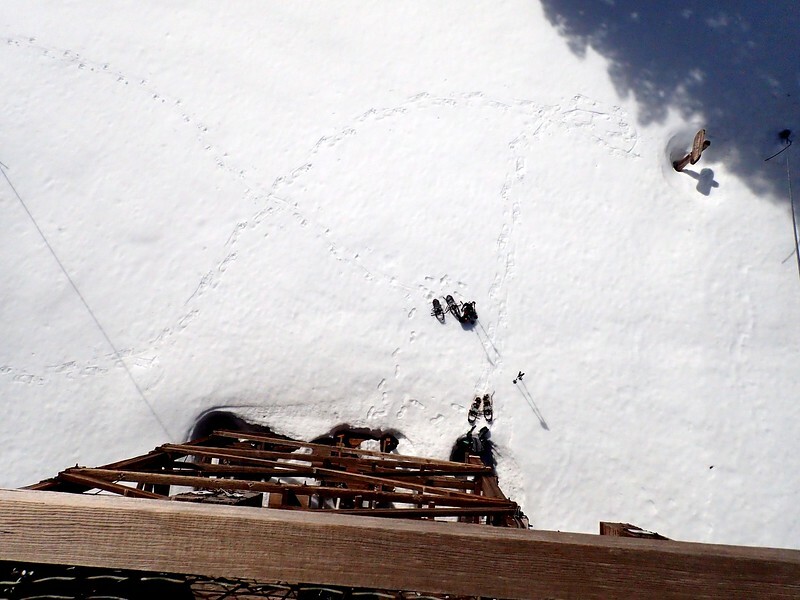 Lucky for us, bluebird conditions persisted until we had finished both visiting the lookout and eating our snack. But within ten minutes of our starting back, the band of clouds ahead of the next storm was overhead and all became gray jay gloom. Sigh. 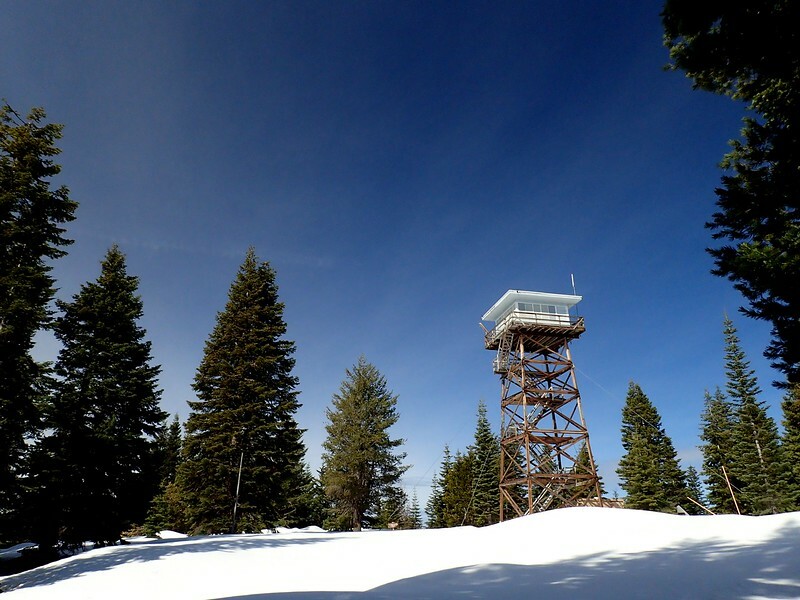 Still, a good snowshoe hike (8.1 miles roundtrip; 1,200 feet of elevation gain) to an historic lookout, with some good views while bluebird conditions lasted. Also a useful check on snow conditions below 6,000 feet. 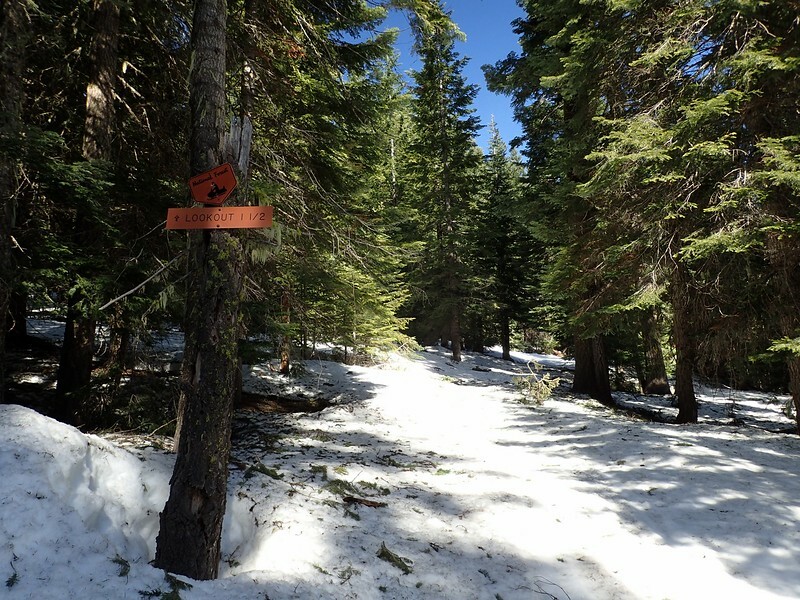 Higher up (like on Mount McLoughlin), there are still areas of soft snow where snowshoes are a blessing and still higher (above 8,000 feet) there is wind slab and snow over ice that really calls for crampons.